The issue opens with not just another Stephen Baxter story, but one right at the very end of the XeeLee sequence, according to the official timeline. It’s in the Old Earth sequence, an Earth with stratified timezones, with time passing more quickly at the higher levels, and more slowly at the lower levels. We follow someone from birth to death, as he discovers more about the Earth, and why it is as it is, and becomes a witness to our galaxy spiralling into a collision with Andromeda. And at this final moment, billennia hence, it is once again Michael Poole. For someone unfamiliar with the XeeLee sequence, or the Old Earth stories (the last one was in Analog in 2006), the ending of the story with its reference to Michael Poole is going to be very, very confusing! Five regular contributors to Analog providing fayre consistent with that which they have provided previously. Enow already. Stephen Baxter. Formidable Caress. (Analog, Dec 2009). Robert Reed. The Long Retreat. 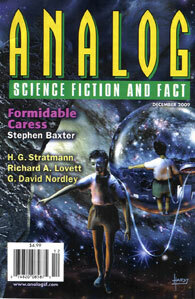 (F&SF Jan/Feb 2010).